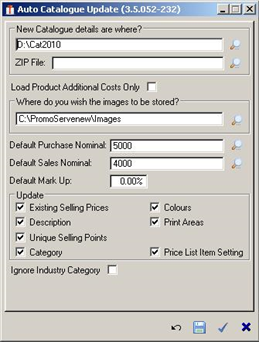 The following will show you how to import data received from a PromoServe supplier. Browse for the data to be imported. 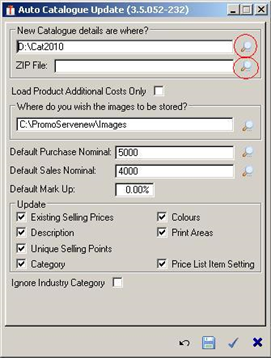 Data can be located in a locally stored folder OR as a ZIP file. Select the default settings for importing the data. If applicable ensure the path for images, nominal codes and any default margin are select. If the data you are importing is a catalogue update i.e. the products are already in your database and you are simply updating, pay close attention to what it is importing. If you have changed any of the data yourself such as categorising products or changing the descriptions, ensure that you do not overwrite this information. If you do not want to update product elements in this update e.g. the category the product is currently in, simply untick the relevant boxes.